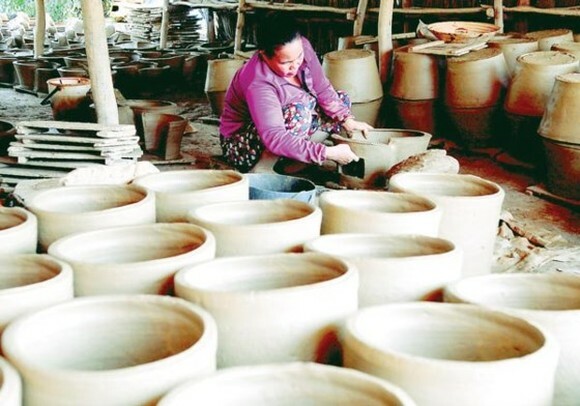 Craft villages in Vietnam have been short of workers while their products are not diversified, some have imported Chinese goods to label local brand names for sale. Therefore, the country needs to have a strategy to develop craft products. The statement was made by Mr. Nguyen Quoc Toan from Farm Produce Processing and Market Development Department yesterday at a press conference on organizing Vietnam Craft Village Fair 2017 in Hanoi. At present, the country has nearly 5,000 craft villages including 2,000 traditional ones. According to Mr. Toan, the strategy should comprise planning, human resource training, technology reform and product design diversification. Especially, relevant agencies must tightly manage product quality and origin, he stressed. At the conference, chairman of Vietnam Craft Village Association Luu Duy Dan said that Van Phuc village sells lot of Chinese silk products while Bat Trang village also has lot of China’s Jiangxi potteries and porcelain. Some shops in the two villages even label Chinese products with Van Phuc or Bat Trang brand names for sale. The situation has not only occurred in the two well-known villages but also many others. Worse, many craft villages in Vietnam have been withering such as Chuong conical hat making village in Thanh Oai district of Hanoi, Dong Ho painting village in Bac Ninh province and La Khe silk weaving village in Ha Dong, Hanoi. Mr. Dan said that craft villages have faced many problems from planning to human resource training. The vocational training program for rural residents have not created breakthroughs for the villages to develop. Mr. Dao Van Ho, director of the Vietnam Trade Promotion Center for Agriculture under the Ministry of Agriculture and Rural Development, said that the Vietnam Craft Village Fair 2017 will be organized in Hanoi from November 9-13. The fair will include by 250 stalls showcasing products of traditional craft villages including one silk stall. The organization board has not invited establishments from Van Phuc village to participate in the event but an artisan whose products have been well estimated by many people from My Duc district, Hanoi. The board also required the fair’s attendees to commit to ensuring goods quality and selling the right products of craft villages.